This is the first post to introduce the new face-lift of my website. I would like to post something I love and genuinely delicious, of course! 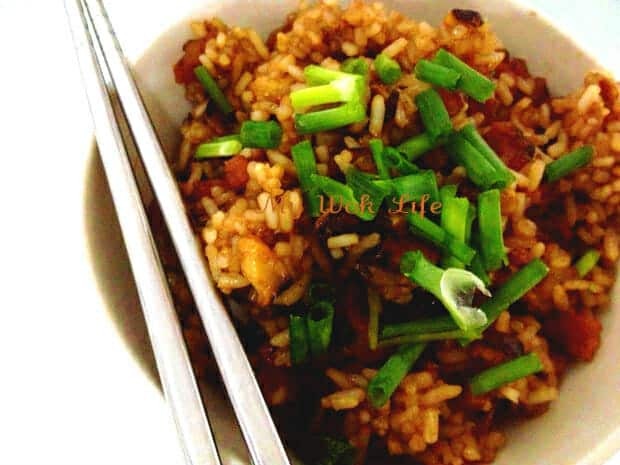 Stir fried glutinous rice, also known as, sticky rice (as its consistency will turn sticky when cooked). It is a very popular type of rice in Southeast and East Asia, widely eaten, in many ways, for sweet or savoury. I am, of course, a fan of glutinous rice, too! Stir fried glutinous is a popular dish in Singapore, Malaysia and Hong Kong. People eats it for breakfast, lunch, tea break, during Chinese festival e.g. Dumpling festival, and even for baby shower, when the baby reaches full month. 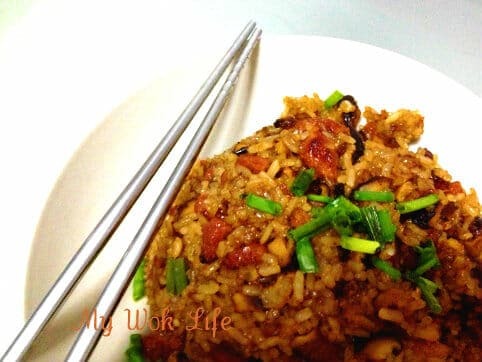 To save time, most of the people will cook the glutinous rice with rice cooker before putting into the wok to make the dish, but for me, I like it cooked in the wok straight from its raw rice. Cooking raw glutinous rice is not difficult, but it requires more time in the stir frying process. However, the satisfaction to accomplish the dish from scratch, is indescribable. 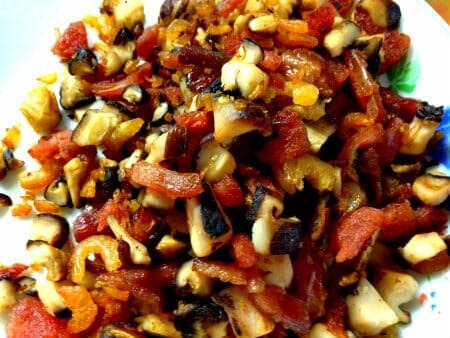 *Steeping of mushrooms, dried scallops and dried shrimps has to be done twice. Retain the second round of steeping water for cooking later. 1) Steep raw glutinous rice with tap water, for at least 3 hours. If you are going to do it overnight, remember to change steeping water at least once during the process. Drain and set aside. 2) Steep all the side ingredients separately. For mushrooms, dried scallops and dried shrimps, first round of steeping requires only about 10 mins. Then, change the water and continue steeping for the second round. Retain the waters. Steeped side ingredients are to be set aside for later. 3) Heat dry wok on medium fire. Add Chinese sausage and waxed meat, without adding any oil. Fry the meat till aromatic and oil releases from the meat itself. Add shredded scallops. Fry till fragrant. Then, add mushrooms and fry the ingredients till excessive aromatic. In Chinese, we called this cooking method as “Bao Xiang”（爆香), fried till robustly fragrant. If you find the oil isn’t sufficient to fry all the ingredients at this stage, add some cooking oil. When done, transfer ingredients out from wok. Set aside. 4) In the same wok, add steeped raw glutinous rice. Keep stirring the wet rice till it dries up and smoke arises. Then, add some steeping water (use the dried scallop steeping water first). 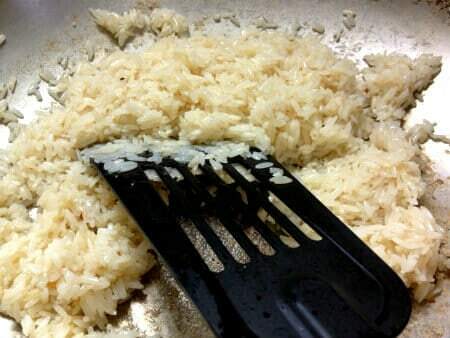 Gradually add the water, in stages, as you fry the rice. Thereafter, add the steeping water of the dried shrimps, also in stages. Keep stirring the rice to avoid excessive sticking. Also, do check the heat level constantly. 5) To check if the rice has cooked thoroughly, simply pick up one grain of rice and press it with fingers. Cooke rice will be soft and only a tiny bit of hard whitish part remains in the center of the rice grain. If the rice doesn’t seem soft enough, add more steeping water and stir fry till it is cooked. Otherwise, go ahead to add chicken stock sauce. Stir fry to combine. 6) Return all the dried ingredients to the wok. Stir fry to combine well. 7) Add seasoning of dark soy sauce, light soy sauce and sugar. Heat off. Garnish and serve. A portion of my Chinese stir fried glutinous rice (sticky rice) counts about 380kcal. Tips: Use non-stick wok to cook the dish. Otherwise, sticking of rice may occurs during the cooking process. * Do not need to add salt as the briny steeping waters should be salty enough to taste. * For the choice of chicken stock, use the thicken sauce or granule type, unless your glutinous is still very hard and you have run out of steeping water to be used. Then, use the water type of chicken stock instead. May I know where I can buy the 金华火煺? Thanks! I bought it at NTUC Xtra supermarket. It comes in vacuum packed with just a few thin slices in it, like how the bacon is usually packed. Those Chinese dried good stores at Chinatown do sell it, too. Hi may I know roughly how long it takes to cook the rice and which level of heat do u cook it with? This will be my first time dealing with glutinous rice and I hope to get it right. Thanks! Cook this on medium-low heat, it should take about 25-30 minutes. You have to taste its consistency occasionally during the cooking process. The cooked outcome should give you soft and sticky bite.